Innah’s Middle Eastern Dance Troupe, Under the direction of Innah Raks, performs regularly throughout central Iowa and beyond. With backgrounds in many different styles of dance, members come together to promote their shared love of Middle Eastern music, culture and dance. 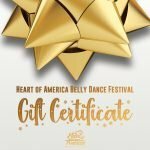 The company, represented by Eugenia, Katarina, Inaya and Karolina is delighted to once again be a part of the Heart of America Belly Dance Festival!